Is the child's website just a marketing tool/strategy? The Number of Children's websites have increased drastically over the last decade. Website access is simple in many cases; it does not require any log in or membership and there are websites varying from a child's favorite television program to their favorite toy. When social networking became popular with sites like My Space and Facebook, toy manufacturers found a way to capitalize on there popularity by creating a new type of website for children. Webkinz,American Girl's Innerstar University and Neopets are all examples of this new type of website for children. These sites target children both in the physical world and also in the virtual sphere. Access to these sites are only granted to children who's parents have first purchased the toy associated with the site. Within these online worlds, the children can interact with other kids who are also members of the online world by using preset instant messaging options, friending one another, and visiting each others "rooms". The room symbolizes the homepage or profile page of users it can be decorated to the individuals preference. Companies who engage in the use of websites like this make money from the purchase of the toy on a continuous basis. The basic membership is free but certain items can only be accessed through a monthly subscription ranging from 5.00 to 10.00. Here is a walk through of the Innerstar university website first without the membership and then with note the differences in user capabilities.In order to be a member the american girl doll associated with the website must first be purchased. Without the purchase of the My American Girl doll, children are limited to move about the site just to see the types of activities they could engage in if they had a doll. 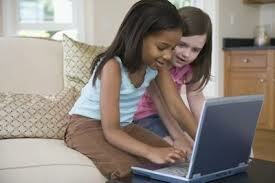 In many cases it is through sites like the above that children are introduced to the world of social networking. They learn the basics about navigating their way around a web page on these sites. They are able to create a home page or profile page, make friend requests with other members of the community and then email those members with a list of preset messages that they can send to one another. Many of the websites have activities that are varying from problem solving to dress up. There is a full spectrum of activities for the children to engage in both to build skills and to promote consumerism. According Claudia Mitchell and Jacqueline Reid- Walsh's book Researching Children's Popular Culture, the purpose of many of the children's sites is to engage the child and to gain the attention of the parent through the use of their children. Mitchell and Walsh argue that, "The obvious intention to the adult viewer is to promote products and encourage brand loyalty" ( p. 144). Thus targeting children will not only create a relationship between the child and the parent, when the child becomes a parent he or she is likely to remain loyal to the brand because of their past relationship with the brand.